I don’t know if it is fair to say that triple-A video games were ever simple, but they definitely used to be simpler. How does one go about describing Destiny? What is the most important aspect of the game? One could argue the defining point of Destiny is that it's a big, new shooter from the veteran studio Bungie. Or perhaps the most important thing to mention is that it is this year's biggest new IP from the risk-averse publisher, Activision. It is a daring attempt to blend sci-fi and fantasy, magic and technology, in ways previously uncharted. It is a blend of MMOs and shooters, the love-child of video game’s two most popular genres. It is also the first non-Halo game for Bungie in over a decade. Which of those aforementioned aspects is the most important for Destiny? What is Destiny’s true identity as a game, as a franchise? I guess the real reason you’re reading this review is to find out if Destiny is any good. Well, just like Destiny’s mish-mash of descriptors, that’s a difficult question. Let’s try to boil it down to the experiences that Destiny provides. All players start with the creation of their Guardian character, and this process is more about looks than anything else. 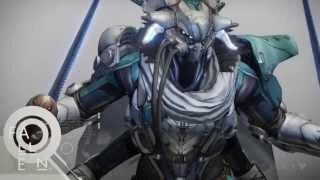 Picking one of the three classes: Titan, Warlock, and Hunter matters a bit -- especially in the early game; but picking between the races of Exo, Human, and Awoken are purely for your viewing pleasure. Like many games built to casually waffle between the new and old hardware of Sony and Microsoft, Destiny’s character models look good, but not jaw-dropping. It’s nice to have the customization options to create unique characters, but as far as mechanics and stats go, there’s nothing substantial to the creative options Destiny gives you. After you’ve got your character, Bungie instantly shoves exposition to the forefront. Destiny’s world is packed with lore, but I’ll try to sum it up. A giant, white ball called The Traveler came to Earth, and fostered an age of space travel as the “human lifespan tripled”. Then The Darkness shows up and everything goes bad. Humanity is down to its last city and The Darkness is returning to wipe everyone out. The larger story unravels in between shooting stuff mostly via conversations with your AI companion called Ghost. It’s amazing how much time and how often Destiny takes to explain its history to you and how you still feel completely in the dark. The problem is that the game is all about telling rather than showing. Instead of interacting with alien species and understanding the way of their worlds, you are usually shooting at them while someone drones on about the history of Mars. Sorry Bungie, you can’t tell me the history of this species and its relationship to Mars while I’m snaking my way through your labyrinth of gunfire. I can’t hear you over my shotgun. It might all be for the best. 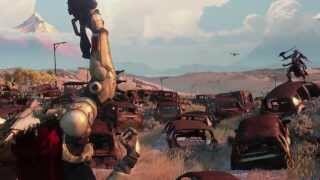 There’s one scene where Destiny threatens to be interesting, but there’s almost no character interactions through the whole game. People can lament Peter Dinklage’s voice acting as the Ghost all they want, but there’s very little he has to work with. Every scene begins with him explaining, monotonously, what the point of your mission is and ends with him saying you’ve dealt a crippling blow to the enemy. There’s so little character development, so much Destiny assumes you will take for granted. For instance, your character is dead at the beginning -- Say what? You’d think that’d be a pretty big deal, this person who magically comes back from the dead, but nope -- no one cares, never brought up again. Maybe it’s because there’s thousands of others just like you, so resurrection is a daily non-event. Bungie seems to believe that cardboard cutouts masquerading as characters, spouting lore, will keep players invested. But it doesn’t. So maybe you didn’t come to Destiny for its five minute long explanations about Venus. Perhaps you just came to shoot things. Fear not, the game has got you covered in that department. In an age where games are concerned with you “realistically” popping out of cover to shoot people like a modern version of Duck Hunt, Destiny reminds you why Bungie’s fast-paced action is so much fun. Sure, you can get behind cover, but the game encourages players to strafe about, bobbing and weaving through opponents, maneuvering and flanking. During the solo campaign, combat encounters are executed with creativity and experience when it comes to pacing. The veterans at Bungie clearly understand how to build tension when introducing new enemies, provide players an understanding for the gravity of the fight which is about to ensue, and construct arenas which are fun to duck in and out of while battling your foes. The gameplay is fast-paced, with little chance for respite -- seriously, there isn’t even a pause screen -- and the various enemies keep the combat design fresh. There are drawbacks, which are a result of Destiny’s attempt to be an MMO-lite, shared-world shooter --seriously, what are we supposed to classify this game as? Mission design is based around killing guys and pushing forward, or deploying your ghost and defending him. When I was asked to deactivate something, it usually just meant shooting at it. There’s intriguing alien races, far off planets, and ancient artifacts that hold so much promise, but Destiny wants to simply shoot, scan, or activate all of it -- then dance about with glee. Story missions often shove you into a tight corridor labyrinth which can be claustrophobic. Taking place in “amazing” ruins that “no one has seen in thousands of years”, the campaign does little to show off these locations. Whether it’s the deserts of Mars or the jungles of Venus, the locales often look similar; a mix of rock and metal. Half industrial complex and half crumbling ruins. It’s also amazing how as man revolutionized itself after The Traveler’s arrival, but all buildings and vehicles all remained the same. The abandoned worlds on Venus feature familiar abandoned skyscrapers and rusted out cars. While human life span was tripling and space age tech took off, no one did away with the car and run-of-the-mill skyscrapers? Thanks, Traveler. At least the Guardians have personal Sparrows to cross the terrain faster. Halo campaigns have had a tradition of being as much fun cooperatively as they are solo, and Bungie continues this trend with this latest effort. Working with friends in unspoken coordination to flank enemies from behind, daringly revive each other, bombarding enemies with heavy attacks, and taking down big bosses is incredibly fun. What might be surprising is how well it all works with a third person added in. Three might sound like a strange number to cap a party at, but Destiny’s levels feel just right. Someone always has your back and you’re appropriately equipped to handle the missions at their suggested level. For better or worse, Destiny tries to be so much more than your run-off-the-mill mission-structured shooter, as it offers a bevy of ways to entertain yourself outside of the story. First, each planet has an open world area where patrol missions can be acquired. Finding these missions and their objectives can be cumbersome as the markers only pop up when bringing up your Ghost which acts as a menu screen. This causes you to stop running or halt your Sparrow while you fumble around to get the objective marker to display again. The side missions themselves are little more than busy work -- probably the most MMO-like tasks in the game: kill ten of these, collect six of those, bring us that thing. The side missions hint at some of Destiny’s deeper lore and future events, but they are delivered so passively it barely serves as window dressing. But with similarly shallow objectives in the campaign, perhaps they are not surprising. To sum up the experience outside of the story missions, Destiny falls pretty flat. There’s not a lot of exploration, just a series of maps you kind of wander through. The worst part is that exploring these maps doesn’t give you anything special. Loot crates are littered through the maps, but they don’t contain better equipment than you couldn’t find elsewhere. Instead of offering a wealth of locales to explore and worlds to discover, Destiny tries to hide its size by funneling you to certain locations they have gently expanded. The other non-competitive type of gameplay Destiny offers are the strike and raid missions. There are one or two strike missions on each planet and a strike playlist, all allowing you to jump into longer missions which require you to play with two other fireteam members. In these missions where cooperation is much more important than in campaign or patrol, members can drop out without penalty, leaving two or even just one guy to fend for himself. While the rest of Destiny’s missions range from great to serviceable, the strike missions are a swing and a miss. They usually feature two or three bosses whose health is slowly grinded away. Taking down all foes -- even with a team slightly above the recommended level cap -- can be an arduous affair. One of the later strike missions feature enemy bosses with recharging shields, meaning we had to first whittle away the shield then do a little bit of damage, only to have the shield recharge and the process repeat. After one of our squad dropped, it took us nearly an hour to get through the mission. If these lengthy missions offered some kind of unique experience, they would be a joy to battle through, but they're so straightforward they feel overly long. At the end of each mission, Destiny gives you a piece of loot or two and a boost to your experience. There aren’t enough drops and rewards for Destiny to feel as loot heavy as something like Borderlands or Diablo, but there is a fair amount of time spent in the menu screen comparing stats. It’s fun to watch your character’s look morph over time, but the drops aren’t as addictive as they should be. I never found a gun I was excited to use or armor that I know would improve my experience. There are no cool bonuses or special aspects to the loot; it’s a dry game of comparing numbers. The more experience you gain, the more abilities you unlock for you character. Class selection comes back into play a bit here. While each class has the same template of abilities -- a special, a jump move, melee attack, and grenade ability -- these skills vary a bit from class to class. The Titan’s grenades confuse enemies, the Hunter’s grenades burst into heat-seeking projectiles, and the Warlock’s can trigger a giant sun-spot. So while there is some variation in regards to classes, the design is not nearly as ambitious as your average MMO. At no point will you be looking for a healer or tank to round out your team. Experience to evolve your character can be gained by killing enemies, completing missions, and competing in multiplayer. You can also get more by turning in bounties. Bounties are usually straightforward, with instructions like “Kill 5 Warlocks in the Crucible” or “Gain 9000 Experience Without Dying.” Grinding out these bounties gets old quick once you’re past the regular game content as it means replaying old missions and retreading old terrain. While the game isn’t necessarily over at level 20, it’s pretty clear the majority of content is designed with level 20 characters in mind. Destiny tells you this is the “Maximum Level” but you can keep leveling up by acquiring exotic pieces of armor with a Light attribute. This means grinding out missions and trying to earn Vangard/Crucible Marks to buy the armor, or just replaying missions hoping to get a good drop. Destiny also features some very basic crafting elements. Each planet as a certain item which can be harvested. These materials can be used to upgrade your armor along with parts and items which are gained by deconstructing weapons. Using these materials to upgrade your armor can allow you do things like speed up cool downs or hold more ammo. While simple once discovered, this is never really explained to players. Unlike Destiny’s dry lore, which it is keen on explaining and over-explaining, the game can often leave you in the dark about gameplay elements. It’s strange to have Bungie multiplayer lose its gritty, masculine voice for the British, sophisticated tone of The Speaker, but it’s a testament to Destiny’s multiplayer design. The competitive multiplayer unlocks as your progress through the game, starting out with Control -- a standard zone-holding mode -- and adds modes like team death match, relic retrieval, and regular deathmatch. Each mode focuses on players racking up their own individual points with stylish kills and important objectives. You might earn 100 points for the kill, but you’ll earn 150 points for a headshot. Destiny not only encourages you to kill, but to kill with flair. The matchmaking is decent and I had many games come down to the wire, making certain matches memorable. For the most part, in a day and age where we have such multiplayer-focused games as Call of Duty, Battlefield, Titanfall, Team Fortress, and Counter-Strike, Destiny doesn’t do anything to make itself stand out. The maps are fine, the combat design is fine, but it’s all just...bland; never did I find myself hooked, hungry for more. What makes matters worse is that matches are a long fifteen minutes. Not that fifteen minutes in itself is too long for a match, but it feels long for Destiny’s design. Plenty of times I would find myself staring at the clock, wondering if this would ever end. By the end of some rounds, I would be just killing time. Destiny never made me think, “One more game, one more win.” Instead, I was usually wondering, “When is this match going to wrap up?”, especially when one team grabbed a significant lead. While the content itself might not always be enthralling, Destiny does do a great job of keeping you connected to the game world. Rarely did I have trouble with the game’s servers, even on day one they seemed to be handling the game’s traffic without issue. The few times I did get dropped, I was able to log back in quickly and jump right back into the action. The holds are just a little long, but nothing unforgivable. Destiny might not blow you away with its graphics -- though many landscapes are very pretty -- and instead it shows off the future of next-gen hardware in a different way. Using friend lists and plug-and-play tech, getting a fireteam together was always easy. I didn’t even notice my friends jumping into my game world instance until they waved me down. Then it was just matter of popping on my headphones and chatting. Destiny is a very multiplayer-friendly experience if you have an established team. If you’re looking to find people and organically cultivate a fireteam however, things can be more difficult. About 16 people can be in an instance at the same time, so it’s rare you’ll find a plethora of people to naturally team up with. There’s no general chat anywhere in the game, nor matchmaking for story missions, so if you don’t have friends in Destiny already, you’re kind of out of luck. Even if you set your fireteam to “public” it will revert back to “friends only” next time you play. Destiny is not a complete experience, at least not in the way Bungie hoped it would be. It bares many of the veteran trademarks of game design; enemy variety keeps combat interesting, levels can be well paced. There’s pockets of a good game tucked away in Destiny. Dancing with strangers in The Tower and working with my friends to bring down end-level bosses is a really good time. But the rest of the experience, the part that was supposed to make Destiny a game you could sink dozens of hours into, is pedestrian. While you’re zipping around Mars, Venus, and the Moon, fighting aliens and recovering relics, you might find yourself wondering if you haven’t done all of this before as you grind to the next level or hope for a Light armor drop. Destiny doesn’t blow the door off the next-gen hinges, but it has pretty landscapes and looks fine running on your shiny, new console. Destiny plays really well. If you’re a Halo fan or are sick of the cover-based nonsense modern shooters cling to, this is a nice refresher. Unfortunately, it’s rare that you’re asked to do anything but shoot stuff. The story-based missions are well paced, but the story itself is lame and the missions all take place in variations of the same design. With thick lore and fetch-quest busy work, Destiny can sometimes feel like it’s wasting your time. The story-based cooperative play is strong, but the strike missions and multiplayer are overly long. The most fun I had outside of the story-based content was trying to get people to dance with me in The Tower. With no matchmaking and no chat, it can be hard to organically get a crew together. The game takes on a significant challenge in bringing an always connected experience to next-gen consoles, but I rarely had server trouble and when I did it was remedied almost instantly. The loading times creep on being too long, but it's nothing serious. Destiny has many great elements at its core, with solid action mechanics and especially if you were already a fan of Bungie’s previous work. But there are many design concerns which bog down the experience, from the boring story to the underdeveloped MMO concepts and dull mission design. Destiny rarely feels engaging or feature-complete. We can only hope the franchise finds its footing in the future installments.